1. Access air bag sensor assembly and inspect for proper connection of air bag sensor connectors. See AIR BAG SENSOR ASSEMBLY under REMOVAL & INSTALLATION. If air bag sensor assembly connectors are not properly connected, reconnect connectors and perform system operation check. See SYSTEM OPERATION CHECK . If air bag sensor assembly connectors are properly connected, disable air bag system and go to next step. See DISABLING SYSTEM under DISABLING & ACTIVATING AIR BAG SYSTEM. 2. Reconnect air bag sensor assembly connectors. Reconnect negative battery cable. Turn ignition switch to ON position. Clear DTCs. See CLEARING CODES under DIAGNOSTICS. Turn ignition switch to LOCK position. Wait at least 20 seconds. Turn ignition switch to ON position. Wait at least 20 seconds. Retrieve DTCs. See RETRIEVING CODES under DIAGNOSTICS. If DTC 24-B1135 is displayed, go to next step. If DTC 24-B1135 is not displayed, system is functioning properly at this time. Check for intermittent fault. See AIR BAG WARNING LIGHT INTERMITTENT . 3. 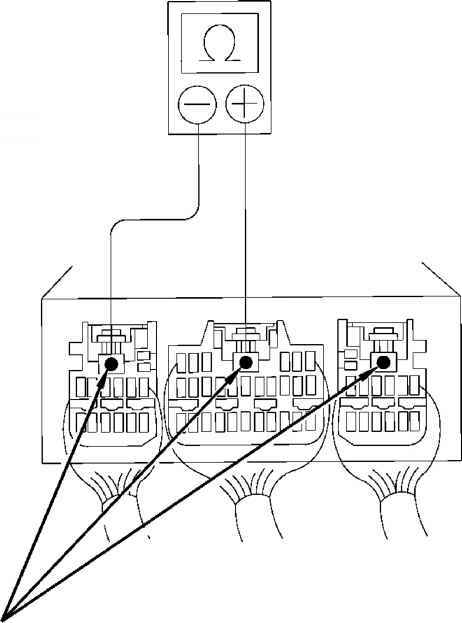 With air bag sensor assembly connectors connected to air bag sensor assembly, use ohm meter to check for continuity between any 2 of 3 air bag sensor assembly connector disconnection detection pins. See Fig. 23 . If there is continuity, system is operating properly at this time. Check for intermittent fault. See AIR BAG WARNING LIGHT INTERMITTENT . If there is not continuity, go to next step. 4. Inspect air bag sensor assembly connector disconnection detection pins for damage or deformation. Compare pins to each other and ensure uniform appearance of pins. If air bag sensor assembly connector disconnection detection pins are damaged or deformed, repair or replace air bag sensor connector(s). If air bag sensor assembly connector disconnection detection pins are not damaged or deformed, replace air bag sensor assembly.